Announcing A&BC Director of Strategic Partnerships! We’re excited to announce a new addition to the Arts & Business Council of Chicago team! Yvonne Orr-El joins us as Director of Strategic Partnerships to oversee development and partnerships for A&BC. Yvonne has been in the fund development, communications, and nonprofit management industry for over 20 years, bringing an extensive knowledge of Chicago’s religious, philanthropic, and cultural art communities to A&BC. Featured as one of the Top Business Owners in Business Consulting & Coaching by Business Owners’ Idea Cafe, Yvonne is an accomplished leader and staff trainer, capable of motivating volunteer and salaried team members to reach peak performance through skills development. 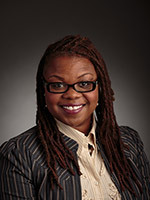 In her previous role as Chief Professional Officer for United Way of Metro Chicago, she worked diligently to develop strategic relationships that generated new opportunities for growth, with oversight of a $2.5M budget supporting nonprofits in the south-suburban region of Cook County. In that role, she demonstrated expertise in philanthropic and nonprofit advocacy, working in collaboration with more than 60 different municipalities. Yvonne is regularly sought out for facilitating workshops for nonprofits and corporations in the areas of developing successful business strategies, entrepreneurship/leadership development, and leading business tactics for female executives. Yvonne strongly believes in giving back, and has served as VP of the Western Regions; President of the Midwest for the National Hampton Alumni Association, Inc.; Vice Chair of the Southland Human Services Leadership Council; Co-Chair of the Cook County South Suburban C.A.R.E. Collaborative; and the Consortium for Civic Engagement for GSU. She currently volunteers with Project Higher Ed and the Monroe Foundation. She is a member of the Grant Professionals Association, AAUW, and NAPW’s VIP Women of Leadership Circle. She was recently honored by Governor’s State University Chapter of Pi Alpha Alpha as an Outstanding Community Partner, and formerly served as Vice-President of the Western Regions and President of the Midwest Region for the National Hampton Alumni Association, Inc.